Making sure that an able workforce is created in an organization is not a task that ends at devising ‘wise recruitment procedures’. This is to say that the activities go well beyond this as ‘maintaining the skills sets of employees’ is also a responsibility of the management group itself. This further requires that a quantitative thought is applied in this regard. One can attain this by bringing a balanced scorecard (BSC) in the picture. This tool is for putting useful set of metrics at one place and further using those for ‘monitoring and evaluation’ purposes. 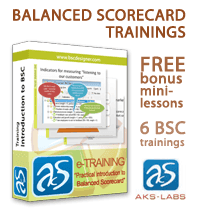 One can develop the training programs in all respects by incorporating relevant parameters in the training scorecard. Moving on, as one starts quest of identifying meaningful indicators, it is observed that often some KPIs (Key performance Indicators) are selected just because those were found to be ‘easy for measurement’. However, in ideal conditions this temptation needs to be avoided as it can fall heavy on the real aims for which the BSC approach was adopted. Concluding from this, one gets that only those indicators that are truly apt in reflecting the changing situations should be favored.